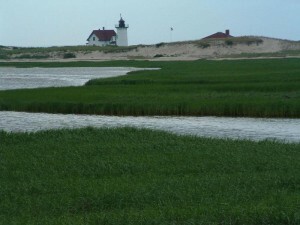 In 1961, the creation of Cape Cod National Seashore in Massachusetts was an early testing ground for how to mesh a national park into living communities. The park’s 40-mile strip of beaches, ponds, bays and dunes is an iconic landscape that has inspired artists and attracted visitors as source of recreation and renewal. Also integral to this landscape are the fishing villages, summer places and communities that serve as a record of the region’s distinctive cultural character. The 43,500 acres in the park’s authorized boundary contain parts of six cape cod towns and over 600 owner occupied buildings. All over the world our coastlines are some of the most valued places to visit and enjoy. However, they are also the places where people have long lived worked and played, and continue to be some of the most desirable land for development. On Cape Cod the U.S. National Park Service (NPS) faced the challenge of how to conserve the seashore’s natural and cultural resources and sense of place without displacing existing residents. The NPS worked with local governments to adopt zoning ordinance consistent with park’s purpose. An advisory commission was established with representation of local and state governments as well as the federal agency. The commission provided a forum to balance the multiple interests in the region. The strategy was successful. Visitors flock Cape Cod National Seashore to climb some of the highest sand dunes on the east coast, walk miles of beaches, and watch the seasonal parade of birds along the path of the Atlantic Flyway. They visit lighthouses, quaint small towns, shop at artist’s studios and enjoy local seafood. Meanwhile behind the scenes, the NPS and its partners continue the challenging mandate of preserving the way of life of the people who live in and around the park along with other park resources. How to provide affordable housing, conserve community character, implement principles of smart growth and preserve coastal resources and waterfront require both acceptance of innovation and consensus among all parties. These partnership principles pioneered on Cape Cod have been applied to the management of other national seashores or lakeshores from the largest Gulf Islands in Florida and Mississippi (137,000 acres) to the smallest Indiana Dunes (15,000 acres) along Lake Michigan. The ideas also shaped the future direction of the NPS, shifting its direction from a land management agency to the even more complex role of partnership management. This ideas developed on Cape Cod prepared the way for expansion by the NPS into some the metropolitan arenas, Gateway National Recreation Area (1972) in Greater New York City and Golden Gate National Recreation (1972) now stretches from San Francisco waterfront across the famous bridge for which it is named. As one scholar of the history of the National Park Service observed, “ The idea of parks as a partnership with the surrounding communities, it all began at Cape Cod”.